Before diving into the spoiler space, here’s a general impression. I really was surprised by how much I ended up liking this show, and the ending was particularly strong. So, this show really did surprise me. I’m not kidding when I say that the key theme of the show is sacrifice. Tony’s victories come hard, and they come at a cost. If not a cost to him directly, then someone else is paying the price – and that is really the message of this show, that someone has to pay the price of heroism. Heroism it is, in a way that you’d never suspect from watching the Iron Man movies. The content here is derived from that Tony Stark and that Iron Man, but this plot (all meticulously approved by Marvel, mind you) leaps off in its own completely different direction. This is a chastened Tony Stark trying to do good in the world by setting up Arc Station in Japan, to take the next step from that gadget keeping his own body (and Iron Man) going and power a nice chunk of Japan with very clean and abundant energy. Even if the dialog is Japanese (but readers may be watching a dubbed version already), Tony’s spirit is very much American… and this creates domestic resentment. 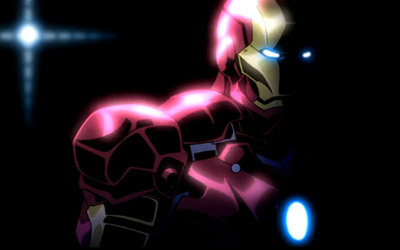 Whoever penned this plot has a very good ear for real-life Japanese political issues, including the specter of nuclear holocaust in Japan, having an American arms dealer on domestic soil (pushing Iron Man clones for the U.S. military), and as a result, very quick suspicion and outright political scapegoating of Tony Stark to take heat off domestic Japanese politicians. Therefore, this is not just a superhero drama; it is a drama about modern Japan, and where it might go if you added a little science fiction to it. Actually, add a lot of science fiction to it. The robots and cyborgs in the show are very advanced, with those of the mysterious, high tech terrorist organization Zodiac providing a lot of grist for events. This being a 12-ep anime, Zodiac is the enemy throughout, with no true “filler” episodes but with good, character led middle chapters along the way. The characters are surprisingly good. I mean, even the annoying Japanese reporter girl is a necessary part of the plot and well, she has a role to fill and has a ticket to punch, so let’s not hate her too much, shall we? I know, it’s easy, but someone has to play this role. The real co-star of the show is the lead scientist of the Arc Station project, a beautiful and highly intelligent woman who naturally gets quite close to Stark (or “Tony”) over the course of the show. But saying more would not be productive. This is a plot you should see for yourself. Some events you might feel coming, or a lot even, but it is well-executed and given strong emotional impact by seriously well-done virtual acting by the voice actors. This show did something I didn’t think it had in it: it made me care. Given the amount of… utter violence done to Tony Stark’s character on the American comic and movie side, this version, fighting for redemption, not for fame but for his soul, and doing the right thing even when it is the very hard thing, is a character I can respect, even cheer for. Oh, yeah, the battles are more than acceptable. There’s better in the universe, but… how shall I describe it? Popcorn mecha anime, I think. As in, you’re not going to get the most profound experience imaginable from these battles, but it’s fun, and there’s no need to be jaded about it. This is a very watchable anime, and it has a strong ending. Greater than the sum of its parts and a surprisingly enjoyable experience. Strongly recommended for anyone even remotely interested in mecha, sci fi, comics and/ or Iron Man. This entry was posted in Anime, Art, Culture, Japan and tagged anime, art, comics, culture, Iron Man, Japan, Marvel, review, science fiction, Tony Stark. Bookmark the permalink.